Can you see that the moon is farther from Spica tonight than it was last night? The moon is shifting farther and farthest east, with respect to the stars, each day. The moon always moves toward the east on our sky’s dome. This motion is a translation on our sky’s dome of the moon’s orbit around Earth. You can observe the moon’s orbital motion from one night to the next by watching the moon’s location with respect to background stars. Alternatively, you can look outside each evening at the same time to notice that the moon is in a more easterly location on the sky’s dome than it was the night before. Just remember, when you do this, that you’re actually observing the moon moving in its orbit around Earth. The moon is now at the waxing gibbous phase. A waxing gibbous moon carries that designation because it is more than half illuminated but less than full. The terminator – or the shadow line dividing the lunar day from the lunar night – shows you where it’s sunrise on the waxing moon. 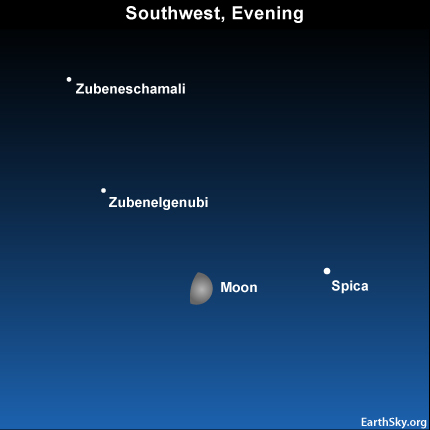 Every July, you’ll find the moon at or near the same phase when it swings between Spica, and the stars Zubenelgenubi and Zubeneschamali in the constellation Libra. 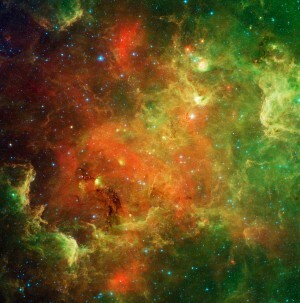 These two Libra stars have been seen as a “gateway” on the sky’s dome by stargazers in times past. That’s because at certain times in the moon’s cycle the moon passes in between Libra’s two brightest stars. For the next several years, though, the moon rides too far south to travel the passage between Zubenelgenubi and Zubeneschamali. The moon won’t start to pass through the celestial “gateway” until the year 2014! Site contents copyright © 2019 Recorder Online	except as noted. All rights reserved. | 88 queries in 2.129 seconds.